Discussion in 'Google TV News' started by dandroid, Dec 15, 2010.
watch? The new Netflix app will also give you personalized recommendations based on what youve watched before. Your TV is now an unlimited source of entertainment. 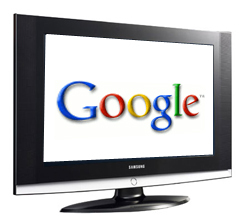 GoogleTV brings the TV and web together in one seamless experience so you can easily watch your favorite TV show and browse your favorite website at the same time. With the feature, you can do things like watch Conan while tweeting about him on Twitter at the same time. Since launch, weve had users give us feedback that they want even more customization options for this feature, and so today we have enhanced it to allow you to re-size and move the window however youd like. What if you could control your TV with the power of your voice? Starting today you can download the Google TV Remote app in Android Market. Apart from the standard TV remote options like changing channels or accessing your DVR, you can now interact with your TV in ways you never have before. For instance, try using the integrated voice search which allows you to find your favorite shows and movies just by speaking into your phone. Or, go from small screen to big screen by sharing videos and websites directly from your phone to your TV. Weve included a short preview of these features below. Stay tuned for more information about the Google TV Remote for other platforms in the near future. Say youre searching for a movie like Harry Potter. Google TV now has a movie results page that shows you all films associated with the title so you can quickly watch what you want, wherever its available -- ranging from sources like live TV, Netflix, and Amazon Video on Demand. You can also read a quick summary, see photos, and find the cast list. Click on the name of a cast member and well take you to a new search landing page where you can find other movies featuring that actor. Trust us, youll never leave the couch again. Between services like GoogleTV, Netflix, Hulu and others, the entire landscape and nature of the way we watch television is rapidly changing. This "Information Age" that we find ourselves in just moves too fast for the old-style television to keep up. It seems that Google has a great handle on the way things are evolving. Obviously, in many markets they seem to be "steering the ship" when it comes to innovation. From Android based smartphones... to television... to cloud-based computing, we seem to be in pretty good hands. It's always great to play with new software!! I will have to see if my Revue got the update, so I can have some fun. Any way to force the update? Quick clarification: Ctrl+Alt+Backspace will not perform a factory data reset, but rather a soft reboot a la Ctrl+Alt+Delete on a PC. For a factory reset: Settings > About > Factory data reset. Even this, however, will not force the update. Thanks for your patience as this rolls out over the next couple of days. Thank you for that clarification GTV Dan.. I wasn't for sure on that one, but I thought it would be a possibility.. I will just have to wait a little longer then. I just moved back home from school for a few weeks and brought my promotional TV along to use at home and share with the family. This is the first time I have used my Sony TV with a DVR and AVR and so far working as expected. Glad to see the Android app out. still haven't gotten the update :| oh well I really use the heck outta the netflix app so I need this update!!! Liking the update. Finally netflix works like it should. Dual view is cool cuz it lets you pick which corner of the screen its in. Those of us with the Revue have had an app and I prefer it to the google app that came out. K ready for the next update. Haven't recieved mine either, really wish there was some way to manually force an update (Google r u listening?)! I was just prompted for the update this morning..... Being able to move the dual view window is awesome. Mine updated overnight ! It's much better. Many of us are inpatiently waiting for the update. Mine came wed. early in the A.M. When I turned the T.V. on, the screen saver was on, that's how I knew I had an update.. I was watching live tv when I shut it off, so, the s.s. was a dead give away..